It is unusual to come across such an elegant, solid, cast bronze, chiming on a bell, Cartel Clock -- especially one with such a great design -- in mint condition. It even has a very high qaulity jeweled platform escapement movement, so it does not need/use a pendulum to run. 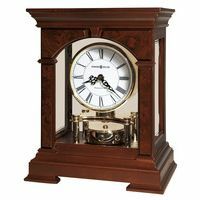 The only bronze Cartel Clocks of comparable quality and intricate yet simple design, that we have seen over many years, also bear the name of Tiffany and Company (which this one easily could have), and fetch several thousand+ dollars. The clock is a keywound 8 Day time and strike movement, and has its original porcelain dial, which is in perfect condition. It also has its original blue-steel colored hands. The glass over the clock dial appears to be its original, and thick, beveled glass. 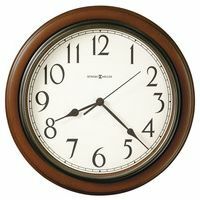 The clock is in excellent running condition, and keeps good time and strikes well, and beautifully. The entire case is made of solid bronze -- one can even see the place (discretely positioned on the clock to minimize its noticeability) inches below the bezel where the molten bronze was poured into the mold, during the casting process. This elegant clock's movement is marked Japy Freres along with Medaille Honneur, the mark used in the company's earlier years. 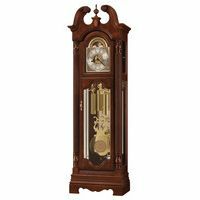 The clock measures approximately 17 inches in height (from top to bottom) and 9 inches in width, from its widest point.